Cadmium is a toxic heavy metal released from smelting and absorbed and bioaccumulated by organisms along the food chain. Cadmium binds to organic molecules by forming bonds with sulfur and nitrogen, thereby inactivating proteins, and is one of the three contaminants which, according to the EPA, pose the most threat to the environment. The objective of this study was to determine the long-term effect of various concentrations of cadmium chloride (CdCl2) on the growth of cultures of Chlamydomonas reinhardtii, a unicellular green algae found in fresh water, by measuring optical density and chlorophyll concentration. This species serves as a good indicator of contamination because it is a simple, sensitive, and ubiquitous organism. Thus, it can provide important information on the toxic effects of pollutants on general metabolic processes and aquatic ecosystems' responses to heavy metal contamination. Although the concentration of cadmium in soil and water can be determined chemically, these methods do not provide information about the effects on growth and metabolism. For this long-term growth study, 100mL solutions of algal 3M media containing a vitamin mix and various concentrations of CdCl2 (0 (control), 10, 25, 50, 75 and 100 mg/L) were used. Measurement of growth was made using a spectrophotometer at 750, 645 and 663 nm to measure optical density, chlorophyll a and chlorophyll b, respectively. This study was done for a two-week period in quadruplicate. Importantly, our results indicate that the viability and chlorophyll content of the cells decreases with a significant increase in the concentration of cadmium chloride. However, sub-lethal concentrations (25 mg/L CdCl2 and less) seemed to only inhibit the onset of exponential growth of the algal cells, while 10 mg/L CdCl2 showed results similar to the control (0mg/L). The growth rate for the concentration of 25 mg/L CdCl2 was inhibited severely, but an extreme drop in optical density was observed for 50 mg/L, 75mg/L and 100 mg/L of CdCl2. The results from the chlorophyll studies were very similar to those obtained for optical density. At the conclusion of the study, pH levels were also measured. Results showed that when growth was inhibited by the high concentrations of CdCl2, the pH levels decreased from 8.92 to a range between 6.68 and 7.04. When growth was observed, the pH increased to a pH level between 8 and 9. These results correlated well with the growth curve and the chlorophyll study. Chlamydomonas reinhardtii is a motile unicellular green algae commonly found in fresh water and soils. The cell contains a single nucleus, chloroplasts, contractile vacuoles, and two anterior flagella and is surrounded by a thin cell wall composed of glycoproteins. It is often used as an indicator of contamination because it is simple, sensitive and ubiquitous. Unicellular green algae can provide important information on the toxic effects of a pollutant on general metabolic processes and in assessing aquatic ecosystems' responses to heavy metal contamination. While others have studied the effects over a much shorter period of time and focused on the genetics of resistance and the isolation and characterization of binding factors (Collard and Matagne 1990; Nagel and Voigt 1989, Cai 1998, Rubinelli 2002), our project investigates the physiological effect of cadmium on C. reinhardtii cultures over a 14-day interval, from lag to stationary phase. Figure 1. Growth of Chlamydomonas reinhardtii in 100 ml of 3 M medium with vitamins containing CdCl2 at different concentrations (0-100 mg/L). Error bars represent standard deviations. Curves were fit by regression analysis. A) 0 mg/L CdCl2; (Control); B) 10 mg/L CdCl2; C) 25 mg/L CdCl2; D) 50 mg/L CdCl2; E) 75 mg/L CdCl2; F) 100 mg/L CdCl2. The EPA's Target Analyte List states that the three contaminants mercury, lead and cadmium pose the most threat to the environment. The major source of cadmium is emissions from smelting that contaminate the soil and water (Cassarett and Doull 1996). It is absorbed and bioaccumulated by organisms along the food chain, with plants absorbing it readily. Heavy metals can act in a variety of ways. They can act as metabolites themselves, or produce precipitates or ligands with essential metabolites, and even compete with essential metals for active site of enzymes or membrane protein. Finally, heavy metals can react with biologically active groups of biomolecules and thus disrupt cell processing (Colins and Stotzsky 1992, Rachlin and Grosso 1993). In minute concentrations, they do not pose a threat and some may act as stimulants of growth (Lee et al. 1999). However, high concentrations can be deleterious or even lethal. The degree of toxicity to cadmium appears to vary depending on the algae used as a model as microorganisms vary in their tolerance to heavy metals depending on exposure (Zhang and Majidi 1994) and different physiological and/or genetic response mechanisms (Nagel and Voigt 1989; Devars et al. 1998). Cadmium binds to organic molecules through sulfur and nitrogen, thereby inactivating proteins (Okamura and Aoyama 1994). The effect of cadmium on plants appears to be linked to its effect on photosynthesis (Zbigniew 1999). This was determined by fluorescence studies and measuring chlorophyll content in the cells. Therefore, chlorophyll content is used as a parameter for metabolic activity of the cell. Uptake of heavy metals involves two phases: a rapid phase, which involves binding of metals to the cell wall and a slow phase, which is the absorption of metals into the cytoplasm (Friis and Myers-Keith 1986). Cells respond to intracellular heavy metals by exporting them into the medium and/or sequestering them intracellularly in specific locations (Pratima et al. 2001). However, the impact of the metal depends on the efficiency of uptake, the metal being tested and the algal species being studied (Vymazal 1990; Lustigman and Lee 2001). The objective of this study was to determine the long-term effect of various concentrations of cadmium chloride on the growth of cultures of C. reinhardtii as determined by optical density and chlorophyll concentration. Since unicellular green algae are primary producers in the food chain and can accumulate heavy metals such as cadmium, it is important to study their effect on growth. This contamination is biomagnified as the algae are consumed by higher organisms. Thus, the effect of the heavy metal at this level can become a much larger problem throughout the aquatic ecosystem. Because C. reinhardtii is so wide-spread in fresh-water environments, it is a good indicator for heavy metal studies. Study of the long-term effect of various concentrations of cadmium may provide information on the level of toxicity and the effect on growth. Figure 2. Chlorophyll content of Chlamydomonas reinhardtii in 100 ml of 3 M medium with vitamins containing CdCl2 at different concentrations (0-100 mg/L). Error bars represent standard deviations. Curves were fit by regression analysis. A) 0 mg/L CdCl2 (Control); B) 10 mg/L CdCl2; C) 25 mg/L CdCl2; D) 50 mg/L CdCl2; E) 75 mg/L CdCl2; F) 100 mg/L CdCl2. The culture of C. reinhardtii was obtained from Carolina Biological Co. in Burlington, NC, USA. The cells were grown in 250 ml sterile shake flasks containing 100 ml Mauro's Modified Medium (3 M) (Kratz and Meyer 1955) at pH 7.9 and with the addition of a vitamin mix containing thiamine, biotin and B12. The cultures were grown under constant fluorescent light at ambient temperature with continuous agitation (100 rpm) until stationary phase was achieved (14 days). Three ml of the stock cultures of 0.37±0.02 optical density, representing approximately 1 X 107 cells/ml, were used as the inoculum. Growth of the cultures was determined by two methods: 1. chlorophyll extraction and measurement by spectrophotometer at 663 and 645 nm and 2. indirect turbidometric measurement using a Beckmann spectronic 1001 spectrophotometer at 750 nm. Chlorophyll extraction was performed following a modification of the Aron method (1949). Microscopic evaluation was also performed. Cultures were read every 3-4 days for 14 days and were periodically checked for contamination on nutrient agar plates. The stock solution of CdCl2 was prepared at a final concentration of 104 mg/L. Concentrations of 0, 10, 25, 50, 75 and 100 mg/L were used. Four flasks were prepared for each concentration of CdCl2 for a total of 24 flasks. For each experiment, a control was prepared of untreated C. reinhardtii in 100 ml 3 M medium with vitamins, grown under the same conditions. The pH of flasks were read at days 1 and 14. Statistical analysis involving comparisons for each pair using Tukey-Kramer HSD was performed to analyze the data and to determine the difference between the various concentrations using JMP computer statistic software (SAS Institute 1995). Table 1. pH values in Chlamydomonas reinhardtii cultures with various concentrations of CdCl2 (0-100 mg/L) after 14 days. The effect of cadmium chloride on the growth of C. reinhardtii shows that it is sensitive to increasing concentrations of the heavy metal (Figure 1). The standard growth curve of C. reinhardtii in the absence of cadmium (the control) is shown in Figure 1A. Growth of the control was greater than any of the experimental concentrations. The slope of the growth curve at 10 mg/L CdCl2 was slightly reduced relative to the control. At 25 mg/L CdCl2, growth was severely impaired. The color of the cells was light green compared to dark green for the control and 10 mg/L CdCl2 cultures. Cells formed clumps at 10 mg/L CdCl2 and 25 mg/L CdCl2. At 50 mg/L CdCl2, there was a complete loss of cells and the culture was clear. At 75 and 100 mg/L CdCl2, there was a severe inhibition of growth with white dead cells were present. Where growth occurred, the onset of log phase was between days 5-7 regardless of the concentration of cadmium chloride. The results seen with chlorophyll measurement were similar to those obtained for optical density. 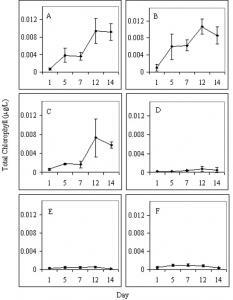 Measurements of chlorophyll content showed similar values in the control and 10 mg/L CdCl2. At 25 mg/L there was a lower concentration of chlorophyll. At 50, 75 and 100 mg/L CdCl2 chlorophyll concentration was extremely low. Using Tukey-Kramer HSD (p= 0.05), results show that the control and 10 mg/L CdCl2 were not significantly different from each other in terms of chlorophyll concentration, but were significantly different from the other concentrations. Growth at 25 mg/L CdCl2 was significantly different from all other concentrations. Results at 50, 75 and 100 mg/L CdCl2 were not significantly different from each other, but were significantly different from all other readings. These results were the same for both optical density and chlorophyll readings. Three methods were used to determine the effect of cadmium on the growth of C. reinhardtii. Based on data from the turbidity studies, chlorophyll concentration measurements, and pH measurements, we were able to determine the effect of cadmium on the growth of C. reinhardtii. While previous studies differ in the methodology and focus from our work (Collard and Matagne 1990; Nagel and Voigt 1989), we have studied the physiological effects of cadmium on C. reinhardtii cultures over a 14-day interval, from lag to stationary phase. We sampled at 3-day intervals, used four flasks for each cadmium concentration and performed statistical analysis of the results. Nagel and Voigt (1989) exposed synchronized cells to cadmium chloride and at 48 hours, direct cell counts were performed and chlorophyll content was measured. In their experiments, duplicate cell counts were also performed, but only a single chlorophyll analysis was performed. Furthermore, there was no statistical analysis to determine the significance of their findings. Since the onset of log phase for C. reinhardtii is 5-7 days, the results on long-term growth are first evident only after 48 hours. We have measured pH as an additional determinant of the effect of heavy metal toxicity on C. reinhardtii. This unique aspect of our work has shown that increases in pH values correlate to increased cell number and relate to photosynthetic activity. The increases in pH seen at 14 days are only seen in cultures with growth. This may be the result of the release of buffering materials by the cells themselves and may be related to the use of H+ ions for photosynthetic processes in the batch cultures. Increase in pH values therefore reflects increased physiological activity of the cells and is directly related to growth. However, when there is no growth, there is a slight decrease from the original values of the media. The lowered pH values seen with higher concentrations of cadmium are due to the cadmium chloride. The effect of sub-lethal concentrations of cadmium on the cultures appears to delay the onset of log phase (25 mg/L or less). Log phase is the period of exponential growth of microorganisms and is a time of intensive metabolic activity. This result has been seen in the past with cultures of Anacystis nidulans (Lee et al, 1994). Thus, resistant cells may be selected for and are able to enter log phase. Alternatively, the cells may release secondary metabolites which chelate the toxic ions, as proposed by Gardea-Torresday et al. (1990). Other authors have isolated resistant cells and found that resistance is genetic, rather than physiological (Cai et al. 1998, Rubinelli et al, 2002). In addition, resistance to one heavy metal may confer resistance to multiple metal ions as well (Okamura and Aoyama, 1994). Cadmium is considered to be among the most dangerous heavy metal contaminants. Resistance of algae to toxicants has significance for bioremediation. Elucidation of the mechanisms for resistance may lead to the production of more efficient means to remediate contaminated waters since microorganisms are capable of immobilizing and detoxifying these substances. This activity is due to the formation of complexes with algae exudes or coagulation and precipitation of these metals (Gardea-Torresday et al. 1990). Heavy metal resistance genes provide information on the transport molecules involved in exportation from Chlamydomonas (Cai et al. 1998, Nagel and Voigt 1989). Metallothioinein-like compounds present in several types of microorganisms function in binding cysteine and lysine to heavy metals. Another detoxification mechanism involves conformational changes in the cell wall that trap heavy metal ions and prevent them from entering the cell (Zhang and Majidi 1994). C. reinhardtii proved to be a good indicator of contamination. The optical density and chlorophyll studies indicated that there was some resistant growth at the CdCl2 concentration of 25 mg/L. Higher concentrations were lethal. The pH also supported these results showing that there was growth in that culture. These results are in keeping with the findings of previous studies. In future work, we will isolate algal cells to explore the nature of resistance to heavy cadmium and determine whether it is genetic or physiological. In addition, we hope to elucidate what mechanisms are used by the cells. We will also explore the effect of cadmium on cultures occurring in natural aquatic ecosystems. The results of these studies would add to the body of knowledge of the effect of heavy metals, such as cadmium, on the growth and metabolic processes of the alga, C. reinhardtii. Aron, DI (1949) Copper enzymes in isolated chloroplasts. Plant Physio. 24, 1-15. Cai, X-H et al. (1998) Heavy metal binding properties of wild type and transgenic algae (Chlamydomonas sp.) IN: New Developments in Marine Biotechnology. Le Gal Y and Halvorson H eds. Plenum Press. Cassarett, C. and J. Doull. (1996) Casarett and Doull's Toxicology Curtis D. Klaassen, Ed. McGraw Hill, New York. Colins, YE and G. Stozsky (1992) Heavy metals alter the electrokinetic properties of bacteria, yeast and clay minerals. Appl Environ Microbiol 58, 1592-1600.
reinhardtii strains resistant to cadmium. Appl Environ Micro 56, 2051-2055. Devars, S. et al. (1998) Enhanced heavy metal tolerance in two strains of photosynthetic Euglena gracilis by preexposure to mercury or cadmium. Arch Environ Contam. Toxicol. 34, 128-135. Friis, N. and P. Myers-Keith (1986) Biosorption of uranium and lead by Streptomyces longwoodensis. Biotechnol. Bioeng. 28, 21-28. Gardea-Torresday, JL et al. (1990) Effect of chemical modification of algal carboxyl groups on metal ion binding. Environ. Sci. Technol. 24, 1372-1378. Lee, LH et al. (1994) Effect of manganese and zinc on the growth of Anacystis nidulans . Bull. Environ. Contam. Toxicol. 53, 158-165. Lee, LH et al. (1999) Effect of Selenium on the growth of cyanobacterium Anacystis nidulans . Bull Environ Contam Toxicol 62, 591- 599. Lustigman, B. et al. (1997) Effects of mercury on the growth of Chlamydomonas reinhardtii. Bull Environ Contam Toxicol 59, 591-599. Lustigman, B. et al. (2001) Algal Biotechnology, in Encyclopedia of Environmental Microbiology (ed. ): Gabriel Bitton Wiley, New York. Okamura, H. and I. Aoyama (1994) Interactive toxic effect and distribution of heavy metals in phytoplankton. Environ Toxicol and Water Qual 9, 7-15. Pratima, M. et al. (2001) Growth responses of microalgae to multiple metal ion stress. Internat J Ecolog Environ Sci. 27, 97-103. Vulgaris to combined cation exposure. Arch Environ Contam Toxicol 24, 16-20. Rubinelli, P. et al. (2002) Cadmium and iron stress inducible gene expression in the green alga Chlamydomonas reinhardtii,evidence for H43 protein function in iron assimilation. Planta 215, 1-13. SAS Institute (1995) IN: JMP Statistics and Graphics Guide Version 3, Cary, North Carolina. Vymazal, J. (1990) Uptake of lead, chromium, cadmium and cobalt by Cladophora glomerata. Bull Environ Contam Toxicol. 51, 24-29. Zbigniew, KZ (1999) Cadmium against higher plant photosynthesis,a variety of effects and where do they possibly come from? Naturforsch 54, 723-729. Zhang, W. and V. Majidi (1994) Monitoring the cellular response of Stichococcus bacillaris to exposure to several different metals using In Vivo 31P NMR and other spectroscopic techniques. Environ Sci Technol 28, 1577-1581.